Grehom candle holders are special since all our candle holders are made from recycled materials. Our range includes recycled brass - mainly sourced from old pipes and taps, wrought iron, aluminium - which comes mainly from old aeroplanes and recycled glass candle holders in various styles. Types of candle holders sold by Grehom includes recycled brass and recycled glass candle holders in various styles. Our brass holders are coloured and finished to look black, silver, antique silver, brown and gold. For tea lights we have glass tea light holders, oil burners, metal tea light holders, glass tea light holders, porcelain tea light holders, wooden tea light holders and hurricane lamps. 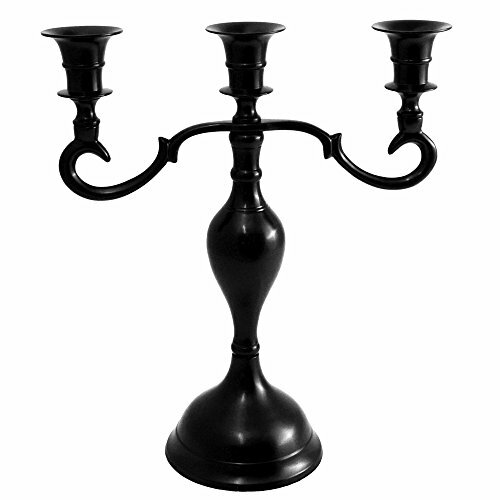 Our range of taper candle holders includes single candle holders, candelabras, and traditional candle sticks. We also have glass bowls for floating candles and metal floating candle holders. We also have a range of brass candle snuffers in silver finish. Grehom candle holders are made from brass since it is a recycleable material and can be reused many times. It is a buttery yellow alloy of zinc and copper but can be coloured and shined to look black, silver or gold. Brass candle holders are easy to maintain, but do require regular cleaning with soft cloth and occasional use of brass polish (available in most supermarkets) to minimise the chance of tarnishing. Weighs 2.2lb, 11.4" tall; Arm span is 10.2", base span is 3.5"
If you have any questions about this product by Grehom, contact us by completing and submitting the form below. If you are looking for a specif part number, please include it with your message.